Results of a CRISPR screen for drug targets in leukemia that are both powerful in their impact and as specific possible to subtypes of leukemia. Left to right: different leukemia subtypes; top to bottom: different potential protein targets. Intensity of color corresponds with degree of a cancer subtype's dependency on the target. 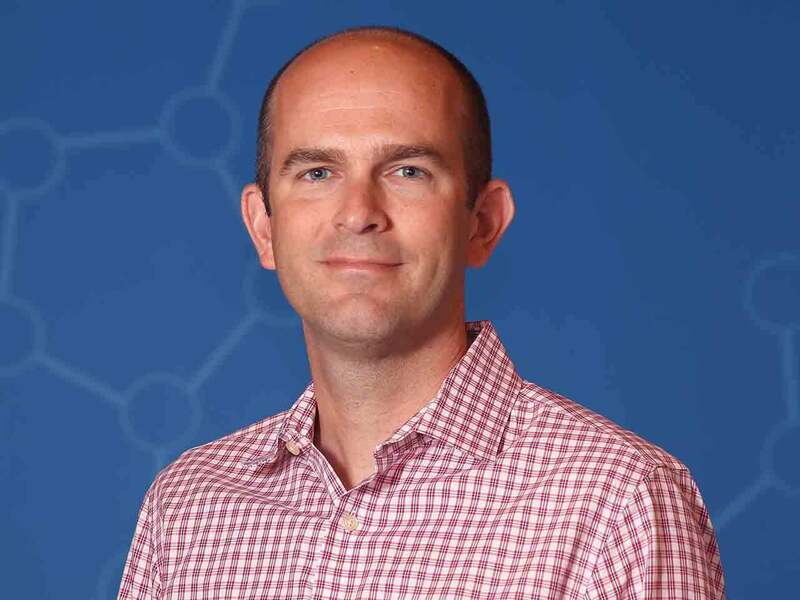 Vakoc's team focused on MEF2C, a transcription factor. Cold Spring Harbor, NY — Scientists at Cold Spring Harbor Laboratory (CSHL) have discovered a way to rein in an overactive protein that drives some aggressive leukemias. The renegade molecule, MEF2C, belongs to a class of proteins that is notoriously difficult to manipulate with drugs. But the new research suggests an opportunity to develop therapies against it. 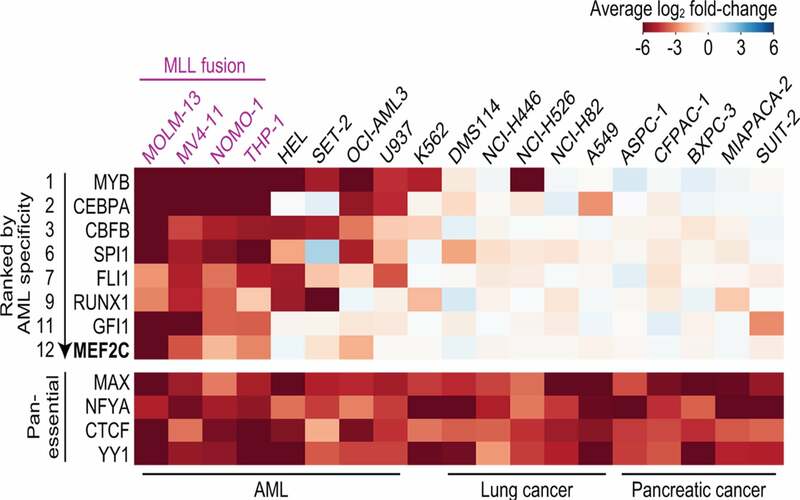 Some AML subtypes depend heavily on the activity of MEF2C, a protein that regulates various genes. Cancer cells prevent HDAC4 from epigenetically modifying MEF2C, which would shut it down. Vakoc lab’s CRISPR screens helped identify two enablers of this pathology in cancer cells: kinases LKB1 and SIK3, which can be targeted with drugs, restoring the ability of HDAC4 to shut down MEF2C. MEF2C is a transcription factor—a regulatory protein that helps control the activity of certain genes. Its overactivity is implicated in about 15% of cases of acute myeloid leukemia (AML), a rapidly progressing cancer of the blood and bone marrow that is often fatal. The discovery is the result of a broad search for potential therapeutic strategies against AML that began several years ago in Vakoc’s lab. In 2013, his team devised a system based on CRISPR gene editing tools that they used to screen large numbers of genes, seeking to discover their impact on cancer cell survival. “We just let the cancer cells tell us what types of genes they need in order to grow,” Vakoc says. Led by Yusuke Tarumoto, a postdoctoral researcher in Vakoc’s lab, the team has now deployed that technology against AML. Their screens revealed that LKB1 and salt-inducible kinase are critical for the survival of certain AML cells. The enzymes had not previously been linked to AML, but with further experiments, the team learned that both help control the MEF2C transcription factor, which is a known cancer promoter. “At the end of project, we realized we’d had actually discovered a way to control a transcription factor,” says Vakoc. That’s exciting, he says, because while most leukemias are thought to be caused by wayward transcription factors, such proteins are among the most challenging to target with drugs. 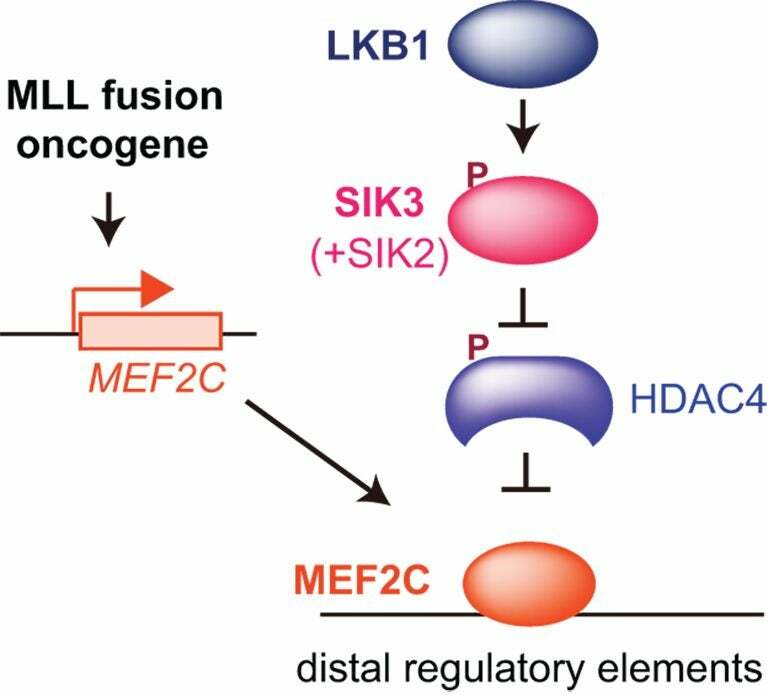 Tarumoto Y et al, “LKB1, Salt-Inducible Kinases, and MEF2C are linked dependencies in acute myeloid leukemia,” appears online March 8, 2018 in Molecular Cell.